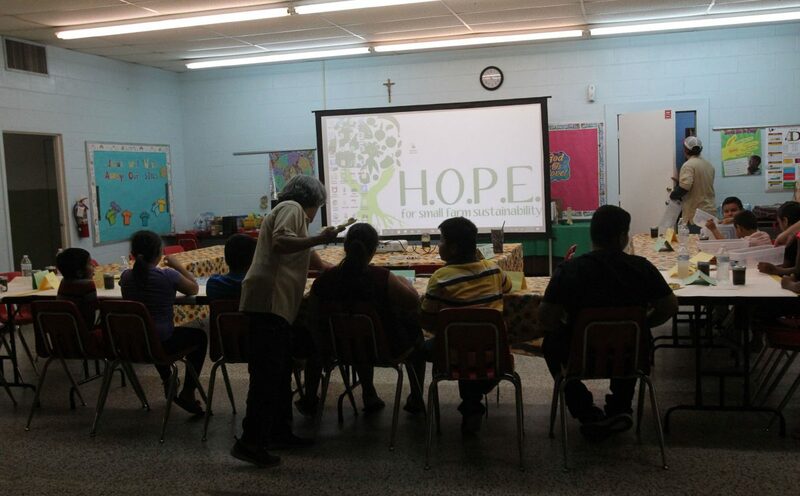 Donna ISD students during a class with H.O.P.E For Small Farms Sustainability at St. Joseph Church Thursday, August,16, 2018, in Donna. The junior chef class in conjunction with HOPE and USDA outreach program on nutrition and farming. Ages from 7-14 years old students took a hands on approach. Children and adults gather around a large wooden island in the center of the kitchen. Fresh mushrooms, tomatoes in shades from bright yellow to deep red, snap peas, green beans, broccoli, and cauliflower are cut and spread out on a large counter. Chef Sergio Esquivel drops carrots into boiling water, which are joined later by a veggie medley. A second skillet is filled with a heap of mushrooms. The students age 10 and older are assigned various tasks cutting fruits and vegetables. Kevin Santiago, 11, rolls masa infused with beet purée into balls, flattening them in a tortilla press. The four-day Junior Sprouting Chefs Club is part of the H.O.P.E. for Small Farming Sustainability’s outreach around the Rio Grande Valley, which is funded by a USDA grant. 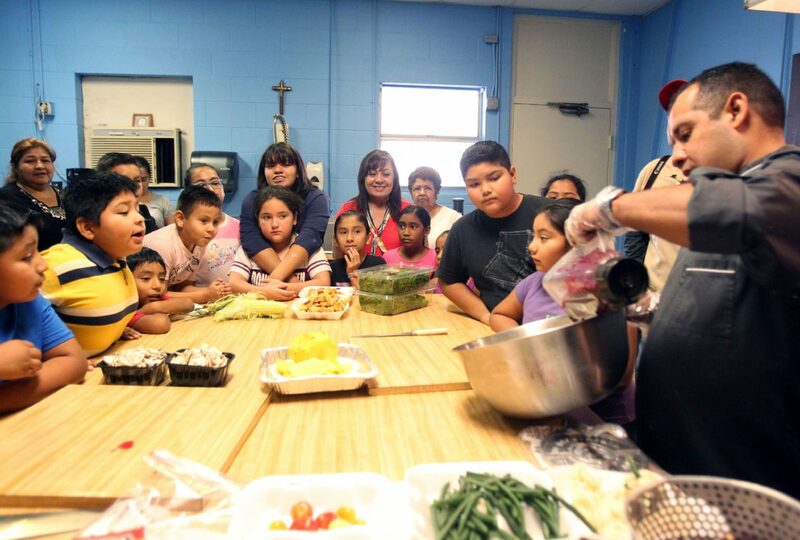 Donna ISD students watch as Chef Sergio Esquivel teaches them them to prepare natural foods during a class sponsored by H.O.P.E For Small Farms Sustainability at St. Joseph Church on Thursday, August,16, 2018, in Donna. The junior chef class in conjunction with HOPE and USDA outreach program on nutrition and farming. 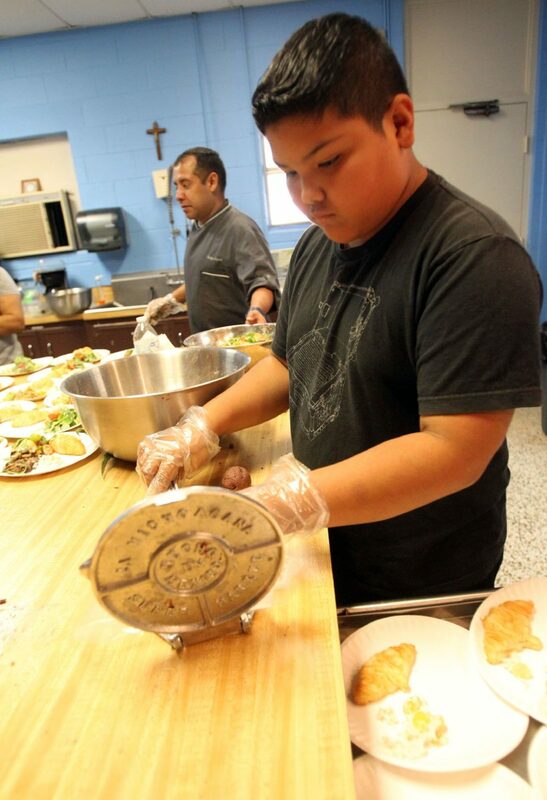 Gustavo Posadas, 11, handles a tortilla press as he makes beet-infused tortillas during a cooking class with Chef Sergio Esquivel and the HOPE For Small Farms Sustainability at the St Joseph's Church on Thursday, August,16, 2018, in Donna. Diana Padilla with HOPE For Small Farms Sustainability talks with parents during a cooking class at St. Joseph Church on Thursday, August,16, 2018, in Donna. This is the first of two four-day sessions for children and their parents at St. Joseph’s Catholic Church in Donna. H.O.P.E. held camps in both Rio Hondo and Harlingen this summer. After next week’s second Donna cohort, the initiative heads to a San Benito colonia for after-school sessions. Since funding supporting the project lasts through September, Diana Garcia-Padilla said she expects her team to also visit schools next month to preach growing and healthy eating. The objective of the initiative is to introduce and familiarize kids with fruits and veggies, she said. H.O.P.E. team member Duane Pace recalled asking students at a previous camp what their favorite vegetables are. Garcia-Padilla said pushing healthier foods isn’t just about the direct benefit of nutrition. Chef Esquivel said parents have to be willing to experiment. The students helped make a mango-pineapple dressing for their spinach salad. The key was combining the veggie with something he liked, Esquivel said. And experimenting won’t just lead to using better foods, but it could save money. While the chef works on the dishes, a bowl of cooked beets are passed around. Some boys, including Kevin, look at the foreign food with trepidation. But when he grabs the purple flesh from the fork and put it in his mouth, he’s pleasantly surprised. “Sometimes they’re scared to eat it because their parents don’t know how to fix it,” Garcia-Padilla said, adding they could not make it at all. And the more connected kids feel to food, she said, the more likely they are to eat it, which is why the curriculum covers planting, growing and composting as well. 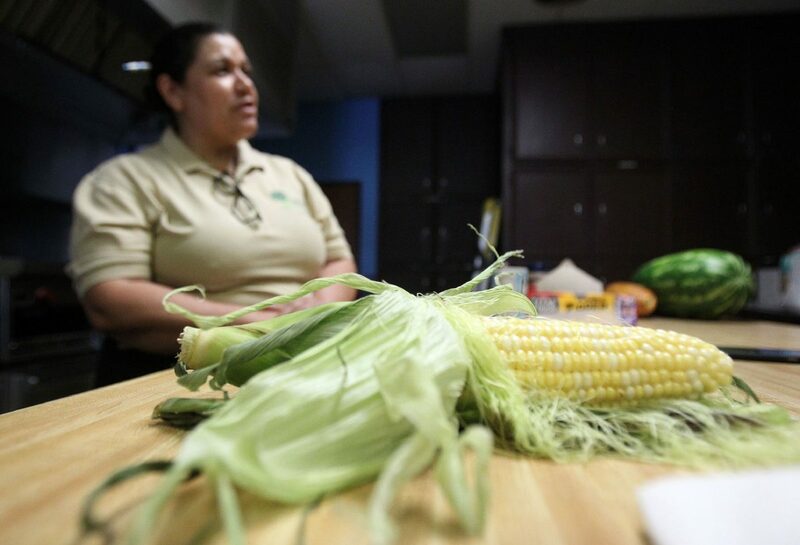 “If kids grow the food, they’ll eat it,” Garcia-Padilla said. But, the team knows the most important part of the program is including the parents. “If parents are not willing to be adventurous with vegetables …. then they’ll continue to give them the same foods that don’t have any nutrition whatsoever,” she said. She called on more parents to get their kids involved in the kitchen and to expand the communal culture of food to also include feeding the family. Garcia-Padilla pulled out her phone and tapped to a message from a program alum parent.